If you have been fishing for a while like me... I would say it is a pretty safe bet that somewhere (or many places) in or around your residence, you have accumulated some fishing gear. Still there is always more gear (stuff), and there is always (at least for me) a new type of fish that I am interested in chasing. 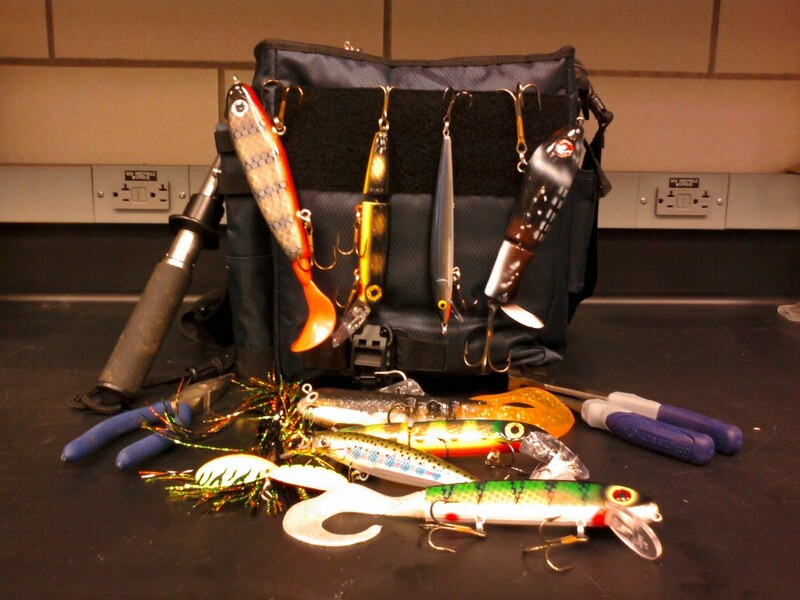 Usually, when it comes time for me to target a new species of fish, I've found that the quest often requires some specialized equipment... which leads me into my current situation. Lately, I've had muskies on the brain... MUSKY MADNESS!!!!!! 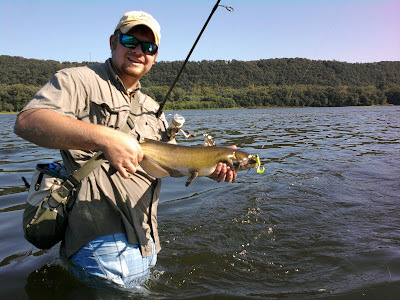 I've been fishing for muskies, watching musky shows, visiting all the musky fishing websites, checking out all kinds of musky gear, AND even purchasing some musky fishing "stuff" (lures, tackle bags, hooks, cutters etc...) It's been a lot of fun! The only problem I have run into, is that I can't seem to catch one. 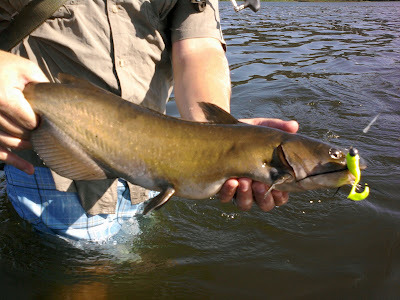 I haven't landed a musky since February...! Central PA is not the best place in the world to be a musky hunter, but it's not the worst place either... 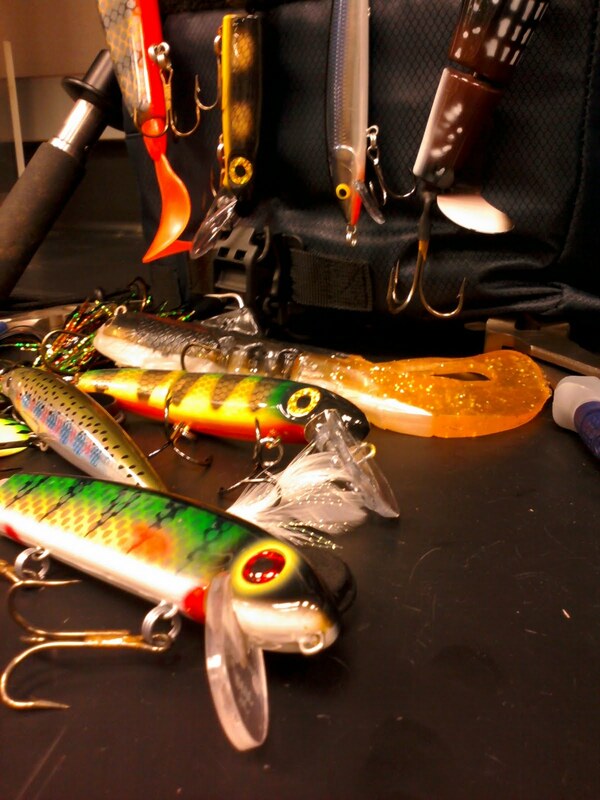 This summer I have drawn nothing but blanks chasing muskies. But I keep telling myself that our local fishery is better in the cooler months. So, hopefully I'll have some decent reports about some feisty toothy critters to share with you this coming fall and winter. As far as recent reports go, I haven't been doing much fishing lately. But I do have one successful fishing report to share with you. Last Saturday was an absolutely beautiful day, and Marianne and I knew that we had to get outside and do something. The air was warm and the sky was sunny, so we decided to go out and do a little bit of wet wading. The fishing wasn't fast and furious, but we did end up having some action. Marianne scored first, with a nice little smallmouth bass that put up a good fight and showed off some aerial acrobatics. We continued fishing for a while with no luck. After what seemed like ages, I finally I got a bite and came tight to a nice fish. I fought it for a while and eventually ended up landing a nice looking channel cat... After fishing for a while longer I ended up landing another nice channel cat. Both fish came on soft plastics and they fought hard in the strong current where we were fishing. After the channel cats, it seemed like somebody officially turned off the switch and we were done for the day--no more bites. If you have been paying attention to the weather lately, I'm sure you've noticed that nights have been getting much cooler. Everywhere I look, it just seems like the woods and waters of central PA are beginning to prepare themselves for a transition towards Fall... That get's me excited! I love fishing in the cooler months, especially Fall. There are so many different options, and so many different species. Fall is such an exciting time of the year to fish! So here is to hoping that this Fall brings with it good weather, fun times, and success on the water. Until then, I hope you enjoy gearing up for whatever species of fish you may pursue (I know I will) and I also wish you the best of luck on the water! Maybe I will see you out there. Thanks again for reading! Nice post, bud! We gotta catch up soon and hit the waters. Hey thanks buddy!!! 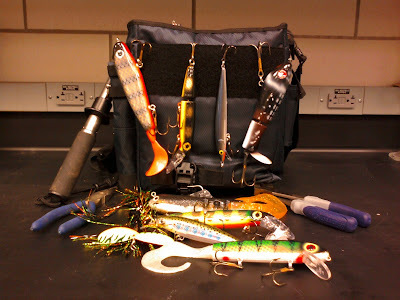 Yeah we need to whack some fish... Maybe some steelhead action this fall dude. Whatcha think?